So every once in a while, I get an email from a restaurant owner or someone affiliated with a pizzeria that wants to put their pizza to the test. 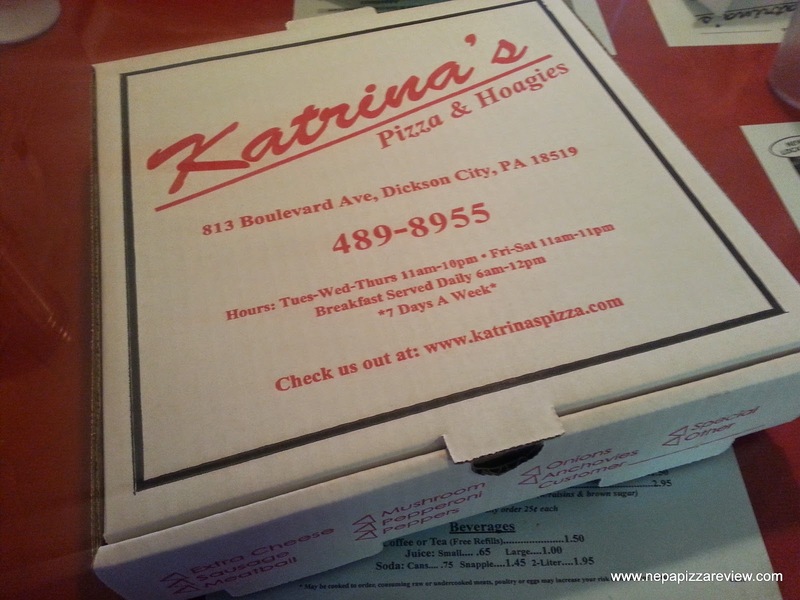 A few weeks back, someone from Katrina's in Dickson City issued me a challenge and since I'm always in that area it was a no brainer to get there and review their pizza. Before being contacted I had never heard of Katrina's, so I had to rely on my GPS to get me there, although it wasn't hard to find at all - located just a few steps off of Main Avenue. I had my newly engaged first lady with me for this review, so this was a milestone as our first review as an official couple together. This may seem like small potatoes to some, but for the first family of NEPA Pizza, we take events like this very seriously! Ok, maybe we don't take anything all that seriously, but rating pizzas is serious business and here's what we found out for you. 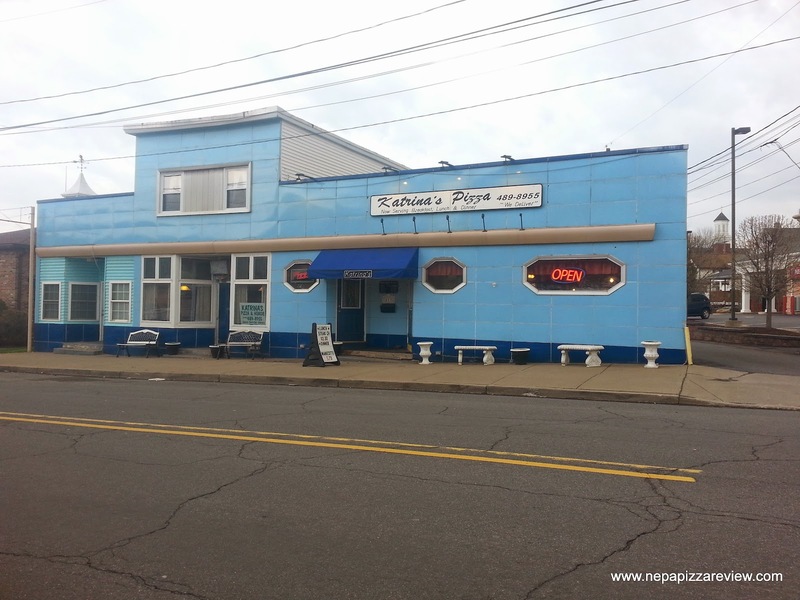 First, Katrina's is a neat little restaurant which is part country style diner, part Italian restaurant, and part breakfast spot all rolled up into one. The place is simple, comfortable, and clean. We enjoyed taking in the cozy atmosphere with red highlights everywhere. The staff was very friendly, and after reviewing the pizza we were even able to meet both the lady who threw down the pizza challenge and the owner, both very nice women who clearly work very hard to please their customers. When looking at the menu, I first thought there must be some mistakes on the prices with hoagies all under $6.00, dinners topping out at $8.25, and 30 wings for $14.50! It all seemed too good to be true, but we placed the order and sure enough, the pricing was correct so if nothing else I recommend you hop on over to Katrina's for the best value in town. We did end up ordering 30 wings so that we could have leftovers for lunch, and we noticed that they were baked rather than fried, so they were a little healthier for us I presume. I prefer a good deep fried chicken wing, but the baked variety was quite tasty as well. So I saved a few calories, and stand a better chance to fit into my tuxedo at the wedding! The real reason we were here was to try the pizza. We placed an order for a large round pizza for $10.25, which was a good value in itself. The pizza was ready in no time and came out as fresh and hot as could be. There was so much steam bellowing from the pie that we had to wait a few moments for it to clear and serve up our first slices. 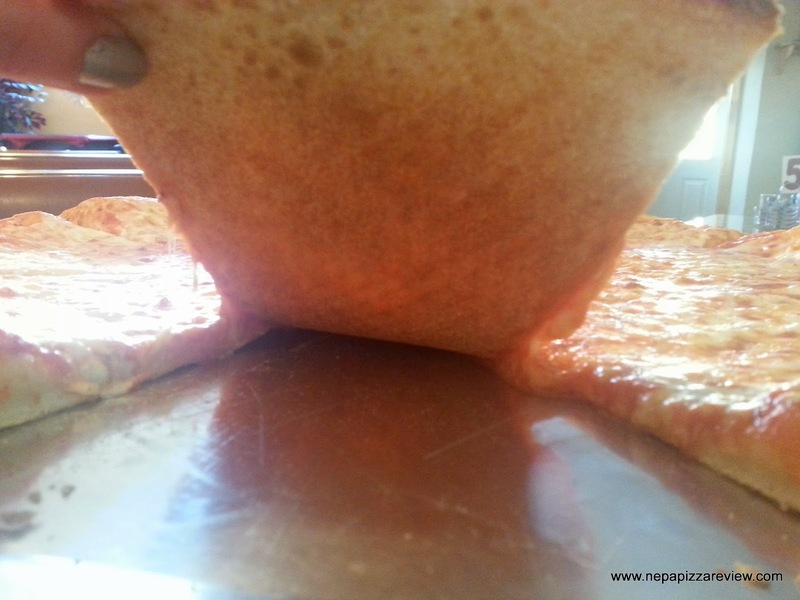 I took a look under the hood to find that this pizza was cooked on a screen, but was cooked properly. The dough was tender and flavorful and topped with a pretty tasty sauce. 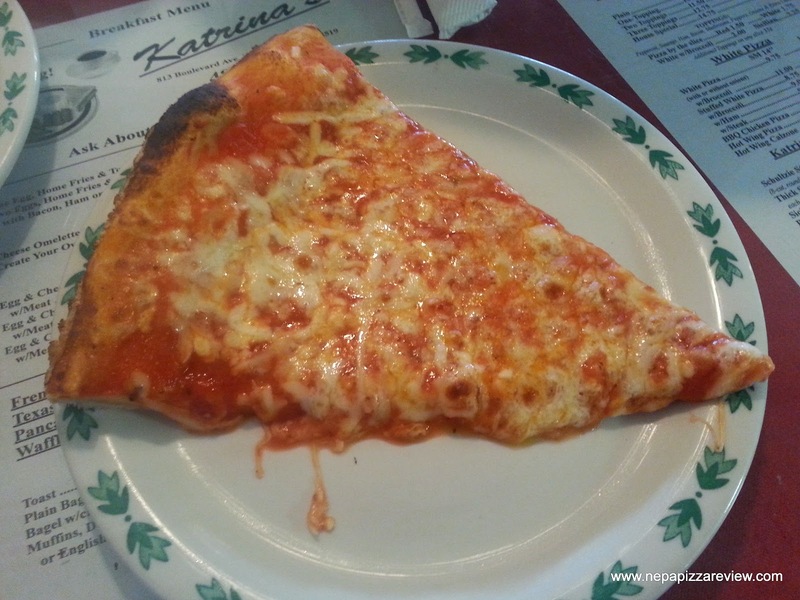 My favorite part of the pizza was the cheese which was moist, stringy, tasty, and had a slight saltiness that balanced out the pizza nicely. The first lady really enjoyed this pizza, and I have to say I liked it as well so I took it as a good sign that our first engaged review was a success. product at a bargain-basement price. We learned that the prices really have not changed since they moved into this location several years ago, so get in there and take advantage of the great value that this place provides. The pizza is a safe bet for just about any set of taste buds. 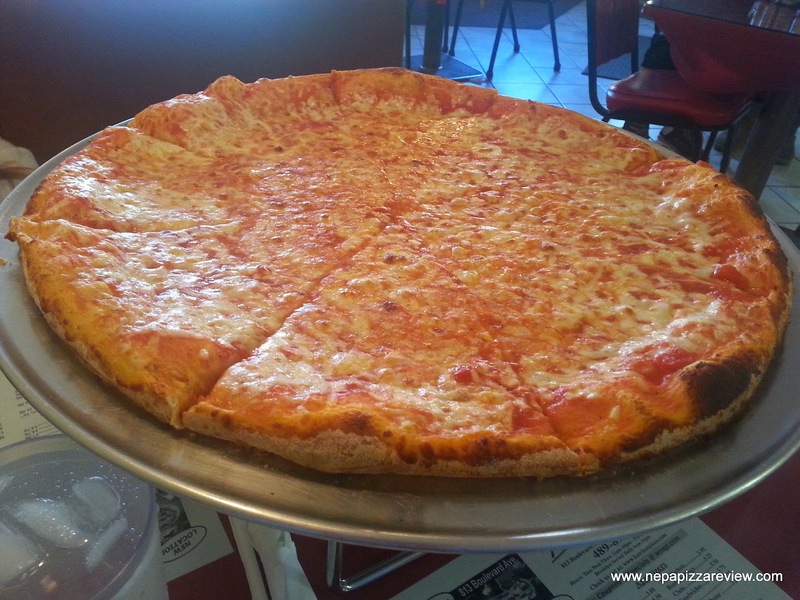 You really can't go wrong, so head on over and tell them NEPA Pizza Review Sent you!